Our pour over coffee filter cone is of the highest quality in the industry. Unlike others coffee drippers our finely woven steel can keep out even the smallest of coffee grinds. This in turn gives you the best TASTE of your brew. Paper coffee filters absorb the essential coffee oils and nutrients and hold back from giving you that extra taste. However, our Stainless Steel filters just hold back the grinds and let that extra perfection pass on to your cup. Have you ever wanted to brew like a professional? Wait no longer. Manual brewing is what is hot today. Eliganté's pour over coffee dripper can give you that professional brew with hot water and grinds. Now you have TOTAL control over the taste of your coffee from start to finish. Brew up to 4 cups of your perfect coffee in less than 5 minutes. Have you ever had bad coffee at the office? You know you have. Bring along your own coffee dripper and create the perfect cup of coffee during your next break. It only takes 5 minutes. Why let someone else give you a standard brew, when you can have the perfect brew. What about Camping or on the Go? Why not live in the forest and enjoy the comforts of home? For most of us, COFFEE enables us to feel good. Bring along the pour over dripper and enjoy your little cup of heaven while "roughing" it in the forest. No Electricity - No Problem. Just keep it in your GO BAG for just such a coffee emergency. MAKES THE PERFECT GIFT FOR ANY COFFEE LOVER! THE PERFECT GIFT !!! IS A PERFECT CUP OF COFFEE - Are you a coffee connoisseur? Our high quality stainless steel pour over coffee dripper will enable you to make the perfect BREW anytime, anywhere. Expensive paper filters absorb the essential oils from the coffee beans, whereas our dripper will enable you to make the perfectly clear and flavorful coffee every single time for 1-4 cups per brew. PERFECTION ANYWHERE - HOME, OFFICE, or ON THE GO! Coffee grounds and hot water are all that is needed for this coffee dripper. No electricity - No problem. No paper filters - No problem. Think of the perfect coffee cup at home, at the office, camping, or even thrown in a GO-BAG for just such an emergency. 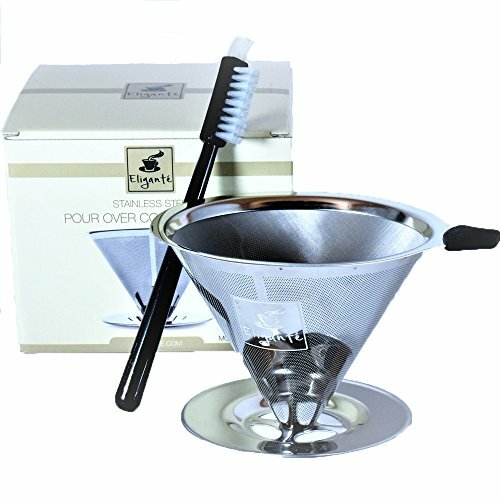 SAVE MONEY AND LESS WASTE - Our stainless steel pour over coffee filters eliminate the need for disposable filters. In turn, this eliminates cost and waste associated with those things while helping to clean up the environment. NO GROUNDS LEFT BEHIND - Do you like to taste coffee grounds in your coffee? Who does? Due to the high quality stainless steel mesh of the pour over coffee dripper, no grounds will be left in your coffee. Just sit back and enjoy your moment of satisfaction. EASY CLEANUP, NO MESS - Cleanup is a snap in less than 60 seconds. Just rinse under warm water and use the enclosed brush to bring it to its original glory. Feel free to throw the Stainless Steel Coffee Dripper in the dishwasher. It's dishwasher safe. NO HASSLE REFUND! If you have any questions about this product by Eligante, contact us by completing and submitting the form below. If you are looking for a specif part number, please include it with your message.